In a large pot of boiling water, blanch the macaroni until al dente, and then drain off the water. Scald the cream with mascarpone, butter and garlic, and then remove from the heat immediately. Whisk in the aged white cheddar, parmesan, dried chipotle and smoked paprika until smooth. Pour the cheese sauce over the still warm blanched macaroni and let it absorb the sauce for 15 minutes. Pick the confit duck, removing all bone and cartilage. Fill the dish halfway with the mac & cheese, then put a layer of duck confit on top. 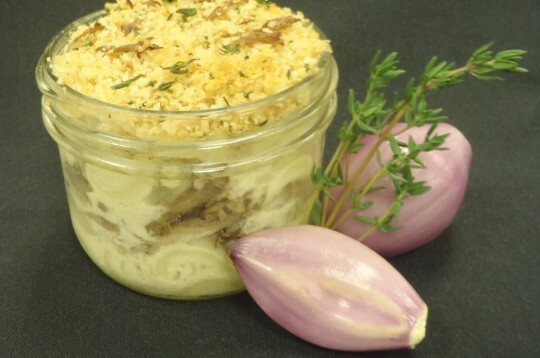 Cover the duck confit with the mac & cheese, filling the dish to the top. In a large pan, fry the thyme and black pepper in clarified butter until crispy then add the salt and panko and toast it in the butter until golden brown. Top the macaroni evenly with all of the toasted panko mix.